Please click to enlarge this photo. This is one of my all-time favorite photos, taken at the shrine of the Virgin of Guadalupe in Mexico City. I’ve been waiting for the proper chance to use it for a loooooong time. Now, finally, the perfect prompt! 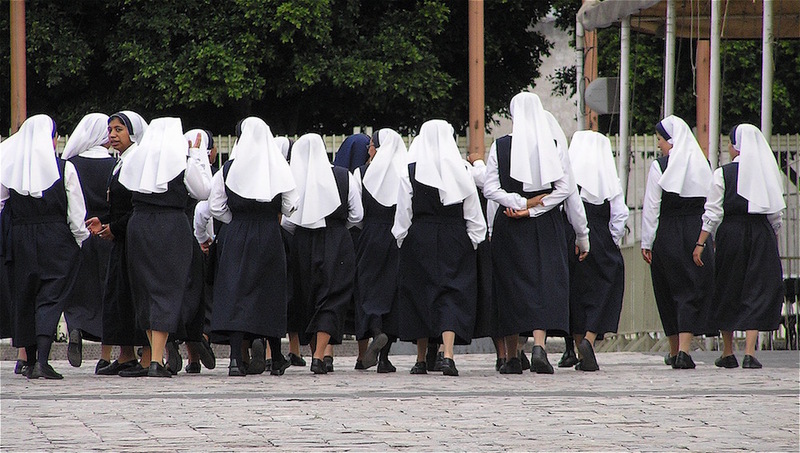 I love the one young nun turning around to look behind her–the rest blithely marching along–seemingly straight into that wall! This entry was posted in Judy Dykstra-Brown photos, Mexico, Mexico City images, Mexico City Photos and tagged Cee's Fun Photo Challenge, images of nuns, Judy Dykstra-Brown images, Judy Dykstra-Brown Photos, nuns on August 25, 2015 by lifelessons.